What to do with my parts? Over the last few years my collection of parts has been rapidly growing, rather uncontrollably (I admit I have maker addiction) much to my girlfriends dismay (she calls me ‘professor’), if you ever see what my front room looks like you’ll understand. Most All of the time it looks like a bomb has hit it, I have parts everywhere! Some opened, some not, some in tubs, all in every form of dis-organisation possible, it would give someone with OCD, well OCD, so I really need to do something about it. Most of the parts I get are usually faily small and the crack den of choice most of my ordering is via aliexpress, these parts arrive in packages of various sizes, from small yellow envelopes to boxes. As delivery can take anywhere from a week to a month, I usually order up what I need from the various vendors for whatever project I’m currently working on, then move on the my next area of interest or revisit an old project while I’m waiting for the parts to arrive. 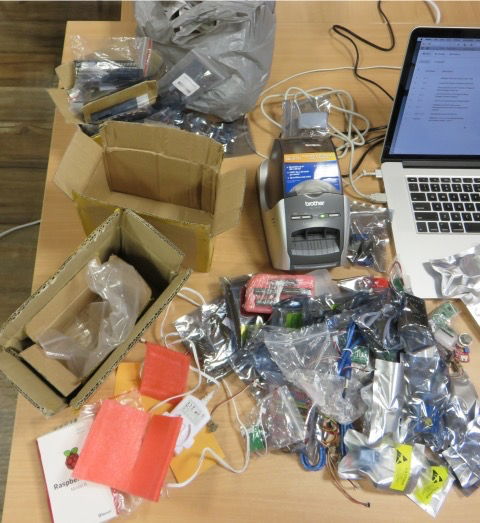 time to work on that project….now where did I put those parts????? I’ve been looking around for open source/free solutions that will allow me to do this as 1) I don’t want to wite anything myself and 2) I also didn’t want to install and manage MySQL or apache/PHP installations and 3) it needed to be flexible for me in terms of categorys and how it handles locations. 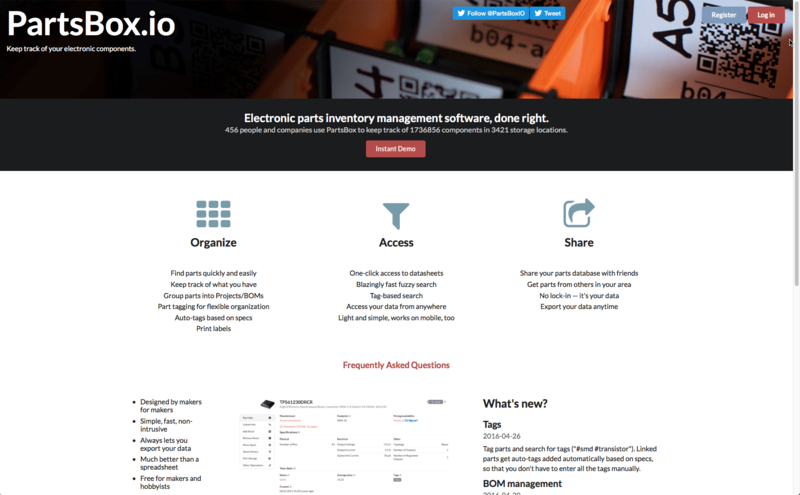 Enter Partsbox.io a free cloud base inventory managment for makers. If the parts on Octopart then most of the hard work has been done for you. You’ll even get a linked data sheet. bonus! Tags on each part are now supported in the latest release (read their blog post) and this allows you to do away with tradional categories, a much more flexible scheme. Also to satisfy my concerns of using a cloud service, I can easily download/backup my data in a JSON format with a click of a button. So in addtion to quickly adding parts to a database I need to quickly add them to a physical location, them means I need to label my part bins, I dont like to just write on things in my crappy habndwriting (I do have some standards you know) I like printed labels and in the past I use my handheld label machine, but this takes too long, one of the reasons I dont end up doing it. I purchasing a Brother label printer that connects directly to my computer and I now have it sitting on my desk attached to my computer all the time. The software is easy to use and it can spit out any size label I need quickly even incrementing number fields. What to store them in? Working in IT I have access ot oodles of old DLT tape covers, I keep any covers they throw away so is perfect size for small things so most of my small boards and parts are kept it. Because parts.io is very flexible with the lcoations I can easily re-lable or re-organise if I outgrow. So far my storage naming schema is very simple – A single letter denoting storage type, and then an incremental number. Then another incremental sub location/bin within this if so needed. As I store the DLT in a Tub these then become bins inside the Tub and becomes B1-A1 within Partsbox.io. This may not be the most efficient or effective but so far is simple and I may revist at a future time, but its a start. Last Saturday we had our monthly maker meeting, as I have’nt been working on anything in particular I decided to that this woudl be a good time to sit down and start organising, so I filled a couple of tubs full of parts to be organised, label printer in hand I proceeded to start my organisation process, quite relaxing way to spend the afternoon actually.